As modern electronic devices get ever smaller, the age of silicon transistors is going by the wayside. Tomorrow's electronics—such as photovoltaic panels, transparent conductors, capacitors, transistors and photodetectors—are likely to be based in state-of-the-art nano-carbon materials, such as single walled carbon nanotubes, fullerene and graphene derivatives. 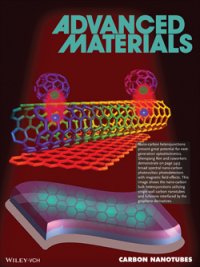 Now, Shenqiang Ren, assistant professor of chemistry at the University of Kansas, has authored a paper in the journal Advanced Materials that pushes forward nano-carbon PV technology by showing how individual nano-carbon allotrope components respond to light. "Silicon has gradually reached its limits with the miniaturization of electronics and the creation of smaller devices," said Ren. "Low-dimensional nano-carbon materials possess exceptional electrical, optical, electrochemical, thermal and mechanical properties and offer solutions for renewable energy and future electronics. In this paper, we've shown the efficiency of broad-spectral photovoltaic photodetectors across the spectrum from visible to near-infrared." Ren said such photodetectors could improve the technology we use in daily life, such as laptops and mobile phones, and also could have applications in the defense industry, as with uncooled infared imaging and photon detection. In either case, electronics based in broad-spectral-response nanocarbon bulk heterojunction excitonic photodetectors would be friendlier to Mother Nature. "Sustainable and low-cost solution processing is another advantage of carbon, in comparison to the silicon technology," Ren said. The photodetectors make use of semiconducting single-walled carbon nanotubes, which the KU researcher fabricated and tested using a combinatorial approach in the lab to map the material's parameters for enhancing the performance of energy harvesting and sensing devices. "Assembling these different carbon elements is the most difficult part of this work," Ren said. "Our next step is to apply this knowledge to build high-efficiency nano-carbon photovoltaics."